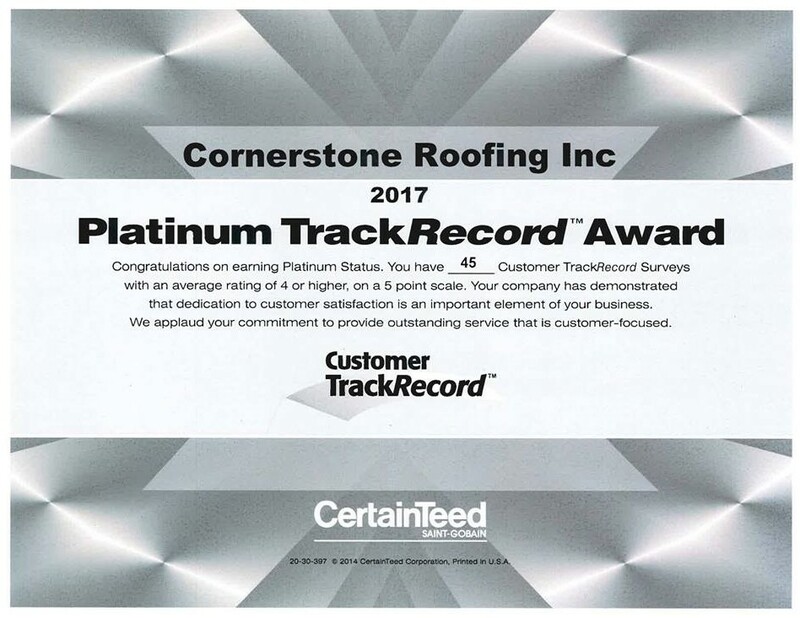 Cornerstone Roofing achieves CertainTeed's Platinum Level TrackRecord Customer Approval Award - Cornerstone Roofing, Inc.
Today we also received our CertainTeed Roofing Platinum Level Customer Approval Rating Award, generated through Cornerstone Roofing‘s rating of 4 or higher on a 5 point scale on CertainTeed‘s Customer TrackRecord Surveys! CertainTeed shared, “Your company has demonstrated that dedication to customer satisfaction is an important element of your business. We applaud your commitment to provide outstanding service that is customer-focused. Only a very small number of companies in North America attain this Platinum status, so everyone at your company can be extremely proud of this significant achievement.” – Jay Butch, Director of Contractor Programs, CertainTeed Roofing.